Good place to go ride after work. From I-81 take exit 13 and head west. Within 3-5 miles there will be a 4 way stop sign, hang a left there and follow signs to the park. Park is on the left with ponds close to the entrance. Trails start after crossing the bridge to the left. At the first tee box you'll see the trail start by the picnic table. Trail is marked with blue blaze. Follow that to top of the hill. At the picnic table at the top of the hill go straight 15yds and be looking right the hit next section. Follow blue markers until you reach another picnic table by the Orchard. Again about 20yds from there trail is on the right. For now this section is it before the downhill section to loop you back. Once you finish this flowy section climb up alon the Orchard and you will catch the singletrack decent from there. Trail rideable either direction. Any questions can be asked on THUMB MTB Club page on Facebook. A: Not designed jumps, a few log crossings and rock drops that can be jumped. Also a few dirt humps that can be jumped. We are trying to do a little more of that. Still a work in progress. Review: Is night riding allowed or not? Says on here it is but the park says closed dawn to dusk. I'm here now and the sun just set. Not sure if I should ride. 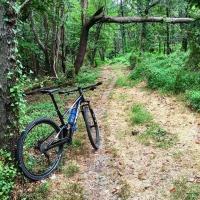 Review: My wife and I rode this trail last Thursday and really enjoyed it. 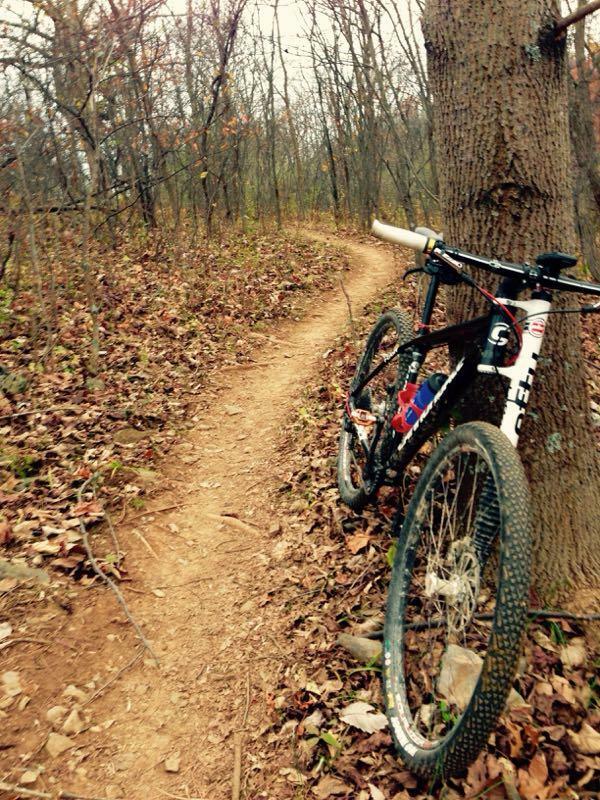 Once you make it to the top of the hill the trail flattens out and is a nice ride, not to many rocks or roots. Only real issue was that the trail was overgrown and without extensive signage it was difficult at times to follow the trail vs the paths for the frisbee golf course. With some additional resources to conduct maintenance as well as freshening up the trail markers this could make this trail even better. We would like to go back in the fall. Review: Great for quick workout. Easy to get to, plenty of parking. Review: Decent trail with a lot of potential. The trails weave in and out of the disc golf course, which may be awkward during busy times. The trees are really tight to the trail right now, and hopefully will be cleared back a little bit over time. I ended up hitting my bars multiple times because of narrow tree passages. This really keeps your speed down on the downhills, but its still a good time. The markings are still a work in progress, but better than nothing. Review: This is an updated review, I have written one in the past. I am a little biased though, I run the club that took over the trail work out here. We are working hard to keep the trails in good shape. I think many of you may understand how hard it is to organize work days at trails. Most just want to ride them. We have been marking the trails but there is more to be done. Signage is in the future. Want to get the loop completed to keep from doing multiple maps and signs. Trail starts at the first tee box for the Frisbee golf course and trail had blue blaze. This trail just needs more traffic and hopefully by this time next year loop will be complete with signs, maps, and markers. Thanks for looking and I hope you can make it out! Poor House Farm Park MTB Trail 3.20 out of 5 based on 11 ratings. 11 user reviews.